For All or Kept Secret? 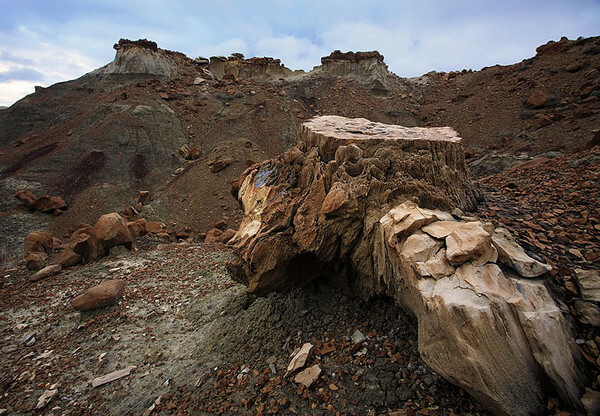 If you heard of old petrified forest somewhere in California or which ever state you are in, would you go looking for it? If you found it would you tell everyone on facebook or a particular web forum where it is? Or would you think about it’s conservation? I have posted this outside of my blog so I do apologize if you have seen it already but I did add the picture. This entry was posted on February 6, 2010 at 4:27 pm and is filed under Uncategorized. You can follow any responses to this entry through the RSS 2.0 feed. You can leave a response, or trackback from your own site. Hey Steve. If I found something cool, I’d caption it appropriately (Great Basin Desert, etc…) but wouldn’t exactly broadcast GPS coordinates on my blog or Facebook. If it was in California I would hope it could be preserved but in times like this it might be difficult to preserve it. Even leaving aside issues of vandalism/plunder, I think It’s nice to leave a little ambiguity as to locations. It would be great to know such a thing is out there, but not precisely where, and thus be motivated to explore areas one might not necessarily get into. I always hope that my photography might motivate people to get out and wander, but not to tread directly in my footprints in the hope of seeing the exact same sights. Blanks on the map and mystery locations are a good thing, and are becoming ever more rare. Richard, thanks for catching that. I probably wouldn’t tell anyone besides some of the people at the State Parks Office that I know. Jenny, If something like that was found I wonder if it would be placed on hold? Jackson, I’ve stumbled across a few things such as this petrified stump be never anything substantial. We gotta love the blanks on a map! Exploring and sharing always leads to some form of motivation. Thanks for your insightful thoughts Jackson.